Art by Taro Morimoto, Yi Lu and Aditi Kulkarni. Paper-mache doll and house by Yi Lu. Photos by Taro and Aditi. April 2011. The turning point after the laundry room event occurred when just three of us remained. 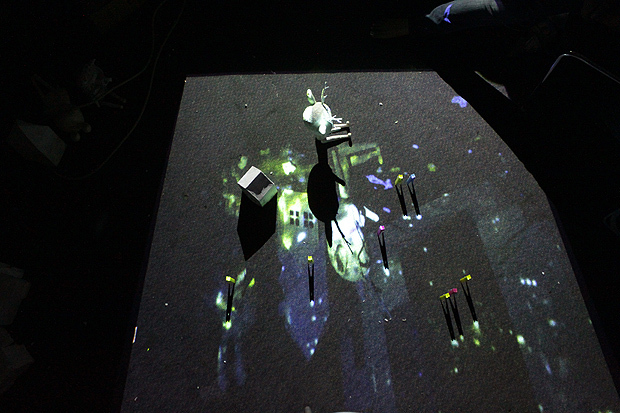 Taro played with the clothespins and the interaction between their shadows and the projected pins of light. Each dot of light represents a real window from the Mumbai cityscape. After taking photographs of the arrangement I projected the photographs on the same objects and together we set up a new arrangement using Yi's fantasy objects that lead to the collaborative work Tobari no Akari. In my opinion, the concept is original, something I have never seen before. It also connected well with my earlier work, where I tried to show the dissonance between the fantasy and reality within Mumbai with the use of shadows. We've aligned the real objects with their respective specular representations (the projection) and their actual shadows. The video that was projected earlier was photographed, therefore this represents a frozen time and place. I'm also interested in the way the mirror projection of the doll is cast like a shadow, and the shadows which are cast in the projection itself. It leads to a shadow, within a shadow, within a shadow, and could be reworked as a more complex loop. Another interesting result was Yi's comment that she sees the points of lights as stars, her view of her toys in a fantastic night which is actually "real" Mumbai. It contrasted with how I saw the work, as a darker fantastical representation expressing solitude and stillness in city. This is an interesting part of our collaboration since we worked almost in silence, agreed on everything and still ended up with such different views on what the work really means. Taro explains the name - "Tobari no Akari" 「帳 の 灯り(or 明かり)｛とばりのあかり｝」 means like "dim light in night curtain," "tobari" means traditional japanese curtain which was mostly used when people sleep. We only use this word to explain "evening" in poetic expression now. For example, we say "Yoru(night) no tobari(夜の帳)" means "robe of night" or "veil of darkness" "no" is " 's" in "Taro's pen". "akari" means dim light, in this case Tobari implies the flame of the projector. In a few weeks three of us will create a larger fantasy city based on the above concept Tobari no Akari, and film the entire process of collaboration.